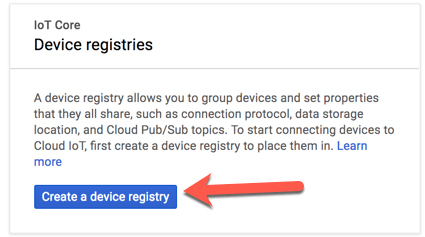 In this blog we will connect the Mongoose OS based ESP8266 with Google Cloud IoT Core and Google Cloud Pub/Sub, which we will be using for it’s MQTT Broker capability. We will not cover the basics of handling and navigating in Google Cloud Console, if you are new to it, please do look at the learning capabilities provided by Google. To get started, we need to create a new project on Google Cloud. Make sure you give your project a unique name and select a billing account. 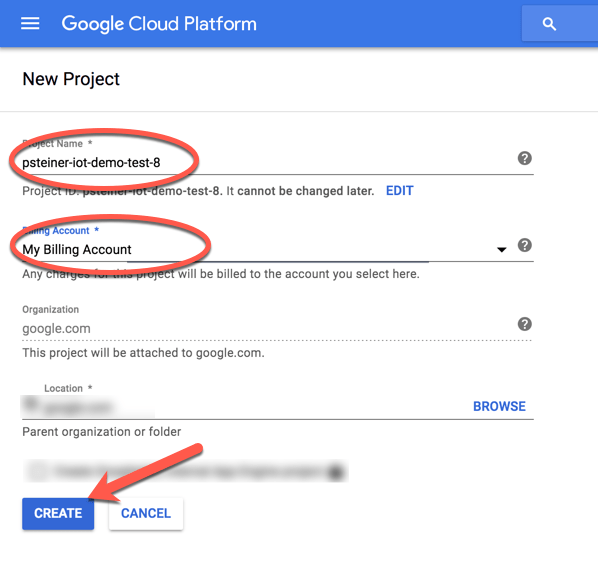 When the creation of the new project has completed, select it on your Google Cloud Console. If your navigation bar at the right side of your Browser window doesn’t show, select the “Hamburger” icon and select IoT Core. For IoT Core to function correctly, you will have to enable the Cloud IoT API. 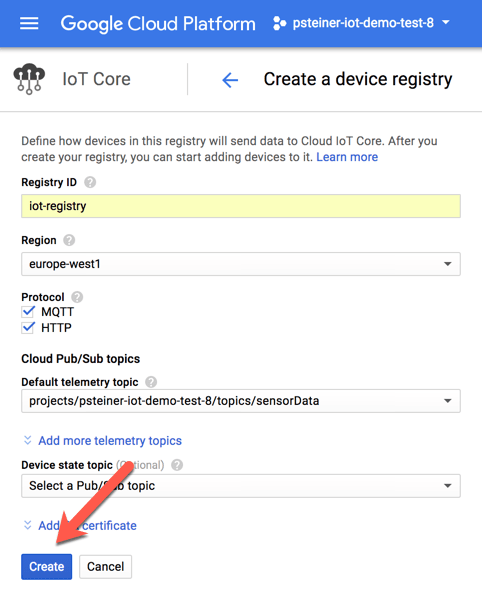 Google Cloud IoT Core includes a Device Registry to hold the information for all the authorized devices, that communicate with IoT Core. Please follow the on-screen dialog and create a Device Registry. You will have to give the Device Registry a name and select a Region for it to run in. You will also have to create a MQTT Topic for the devices telemetric data. 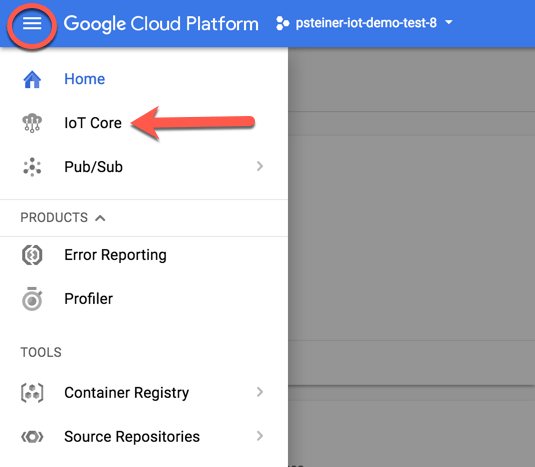 On of Google Cloud IoT Core functions is to a Protocol Bridge which works in combination with Google Cloud Pub/Sub. In our case we want to receive message via MQTT ( HTTP is selected as a possible protocol in the screenshot as well, but not used in this setup ) and want to forward them for further processing. 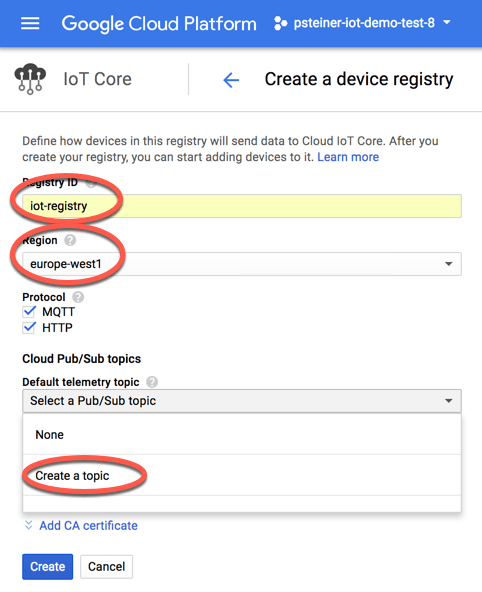 So with the Create a topic step we actually create a MQTT Topic in Google Cloud Pub/Sub, while IoT Core will make sure to bridge the incoming messages to this MQTT Topic in Pub/Sub. Later, when we adapt the code of our ESP8266 we will see how to address the MQTT Topic of IoT Core. The newly created instance doesn’t know yet about and devices, but this will change when we “introduce” our ESP8266 to it. This concludes the preparation of Google Cloud IoT Core and Pub/Sub. The next blog will explain how to adapt the ESP8266 created via Mongoose OS to send messages to our cloud instance. 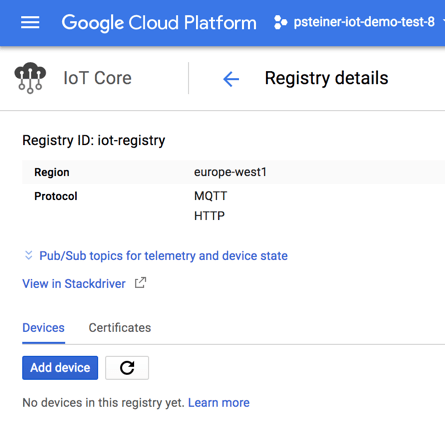 In the next blog we will cover how to enable our ESP to send MQTT Message to Google Cloud IoT Core.